What fashion magazines and reality TV shows expose in design studios and on the runway, 82-year-old photographer Bill Cunningham has found on the streets, night and day, of New York City. Vogue , Elle , “Project Runway,” “All On the Line” and their ilk may have the cachet and ratings, but Cunningham’s weekly photo essay, On the Streets , in the New York Times has been in fashion for decades with a distinctive style of its own. Bill Cunningham New York, directed by Richard Press, documents this street artist by day and glamour photog by night who doesn’t differentiate much between the two. Think of Cunningham as one part populist, one part paparazzi, and who, like the French, believes that the human body is a canvas and that culturally we are, at least in part, what we wear. Daily, the photographer traverses the streets and sidewalks on an old Schwinn bike capturing intuitively a fashion motif just before or while a new trend and features it in his weekly montage spread. This documentary shows Cunningham to be both impish and fearless in front of rising and falling hem and necklines, gravity-defying waistbands and a palette of patterns and plaids that vary from couture to outré. At night Cunningham seldom misses an opening or charity event as he hobnobs with the power structure and social elite with the same discerning eye and revealing lens. As Vogue editor Anna Wintour comments on screen, “We all get dressed for Bill.” Wintour is one of several interviewees, including fellow photographer, 98-year-old Editta Sherman and founding editor of Details magazine, Annie Flanders, who speculate on what makes him click with both his public and this mercurial industry. But it’s Cunningham who has the last word. He tells director Press his camera was a gift from a friend who advised him to use it “like a pen.” For the next 60 years or so, Cunningham did just that, letting his imagery speak thousands of words about the human condition and people’s need to express themselves while entering their workaday conformity. For him and his subjects, “ready to wear” means ready to be seen on a much larger runway. Ironically, Cunningham is no fashion plate or clothes horse, but he does have a “look,” more pragmatic than fashion forward, and in the end, stands out nonetheless. His “uniform” consists of a simple loose-fitting, blue jacket with pockets o’ plenty first seen being worn by street workers in Paris. That and an orange safety vest for his bicycle sojourns. At night, he’s one of the proverbial PIB’s, people in black, but stands out because of his smile and personality. Simplicity describes Cunningham’s photo style as well as he is more interested in revealing his city than interpreting it. He remains so detached from his work and the spotlight that for years he lived in a rent-controlled, artist studio apartment in Carnegie Hall with file rather than kitchen cabinets and a bathroom down the hall. No one could accuse him of being a Renaissance man so narrow his focus and interests. His art defined him though he objects repeatedly in the film that he’s not an artist, let alone a “real photographer.” The French disagreed and recently made him an Officer in the Order of Arts and Letters, which almost brought the reticent photo-artist to tears. A more crying shame was Cunningham’s eviction from his ascetic digs by the less appreciative owners of Carnegie Hall and his subsequent reinstallment in a posh apartment overlooking Central Park. A nicer view but a rather odd one for someone more at home at street level. 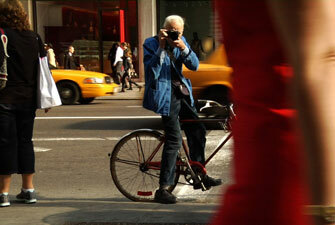 Grade = A- Bill Cunningham New York opens April 22 at Film Streams, 1340 Mike Fahey St., and runs through May 5. Check out filmstreams.org for showtimes. On Friday, April 22, Film Streams will host “We’re Getting Dressed For Bill,” in which the most eye-catching ensembles worn by movie-goers to the 5:55 p.m. and 7:50 p.m. shows can will prize accessories and a chance to win a $25 gift certificate to Trocadero, 1208 Howard St.